The biggest island in the Cyclades group, Naxos Island is a popular holiday destination renowned for its long sandy beaches, high mountains, fertile land, picturesque countryside, Venetian watch towers, monasteries and Byzantine churches. Offering a wide range of beachfront hotel accommodation, Naxos holiday packages are the ideal way to maximise your time and sightseeing on this culturally and historically-rich island. A wonderful way to explore the picturesque countryside and ancient attractions, Naxos Island holiday packages allow you to plan and book your stay in popular areas such as the beachfront resort towns of Chora, Agia Anna and Agios Prokopios. Allowing you to combine all your travel needs in one discounted package, Naxos holiday packages save you both time and money and make finding your way around a foreign country both easy and affordable. Whether you want to visit the Venetian castle, the 13th century Catholic school or the many museums, Naxos package deals have everything you need. 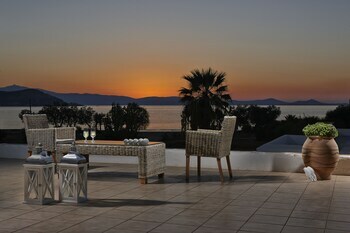 From the unspoilt beaches to the mountain villages, Naxos Island packages allow you to see more. There are a great range of existing holiday packages to choose from, or you can personally customise one to suit your own flight, accommodation, tour and travel insurance needs.